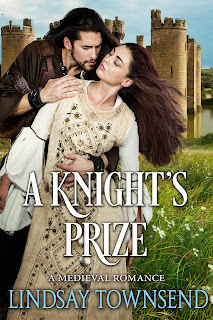 Lindsay's Book Chat: To Touch the Knight - Now Reissued as "A Knight's Prize"
To Touch the Knight - Now Reissued as "A Knight's Prize"
With a cast of strong characters, Townsend will blow you away with To Touch the Knight. Townsend’s historical romance is down right delicious read because it not only encompasses romance, it tells us what 1391 during the plague was like and how there was those who sought to exploit others during the time. Knight Sir Ranulf of Frendenwyke doesn’t like what’s happening around him, but there is little he can do. It’s all about how both Edith and Ranulf interact with each other and if Edith will feel safe telling him her true story about being a princess, after all her people come first before anything else. The passion and interaction is electric between the two, those who love historical, medieval romance are sure to like this wonderful story during a time that was not as beautiful. The time of the Black Death was terrible for people in England and Europe. Townsend treats this period with honesty and sympathy. Parts of the book are perhaps dark because of the period but there is also a great deal of humour, fun and sensuality in this book, which should delight Townsend’s fans. I found it a thoroughly enjoyable read and the equal of her earlier knight books. This author is one to be followed as she carves a prominent place for herself on the historical list. If you enjoy medieval you must read this, because it is one of the best. This book completely deserves its five red roses. Danger is close, pestilence still exists, and Edith’s old Lord is after her adding a tremendous amount of suspense, so the words pass quickly as you read. This was an exciting tale with plenty of plot strings crossing back and forth to keep your interest. To Touch The Knight is a finely woven tale that has more than one intrigue you don’t expect in a historical. Ms. Townsend is able to bring forth a happy ending to a group of people who were horrifically affected by the plague. I was so intrigued by the plot in To Touch The Knight I was unable to put it down until I finished the last page. If you want a little different historical romance then I Joyfully Recommend To Touch The Knight. The whole “heroine masquerading as someone else” plot device has been done to death, oftentimes in such a silly manner that it is impossible to take the story seriously. Edith’s deceit, though, worked for me because a) there was a real element of danger involved, and c) she does an excellent job of remaining in character. Edith hatches this plan as a way to ensure that she and the villagers live a reasonably comfortable life in the face of being virtually ousted from their fief. And though Edith may lapse at times, like forgetting her gloves, she is always aware of her position and the grave consequences of discovery. All of this illustrates Edith’s intelligence and resourcefulness as the reader learns how and why the idea for the masquerade comes to her. The overall feel of the novel was very authentic for me. The Middle Ages were brutal, difficult times and the author does not shy away from that. The specter of the Black Death looms ever present, to the point that it almost feels like another character. The characters have witnessed the devastation it has wrought over the land and are terrified of its power, particularly Edith. Her brother Gregory died of the pestilence after they escaped confinement in the church. Though deceased, his presence haunts Edith throughout the story in the form of her conscience. This, as well as her openly agnostic beliefs, adds an interesting dimension to her character. Ranulf also hears the voice of his late wife Olwen in his thoughts, however, in sharp contrast to Edith, he has retained his traditional belief system. I found the contrast in their beliefs unusual, but welcome, territory for the author to explore and I give kudos to her for each character maintaining their stance throughout the novel. Edith does not suddenly resolve her doubts and anger with the discovery of true love, though Ranulf makes great strides in easing her troubles. For me this helped to make her a believable character and I appreciated that she maintained her independent way of thinking. ... Minor criticisms aside, I would recommend To Touch the Knight to lovers of medieval stories, especially those with fascinating, well-characterized heroines. Compelling characters and suspenseful moments will keep readers well entertained, but the dark motifs and plague plotline may be too somber for some.